Cheese is easy. It's so easy, you already have three ingredients for the easiest cheese in the world in your kitchen right now. All you need is blue-top milk, a lemon and some plain salt and you're away, and the great thing is you can make it just after breakfast and eat it with lunch or dinner. Plus there are 16 more recipes for cheese and dairy products from butter and cream cheese to cheddar, edam and farmhouse blue. Cheese-maker and tutor Jean Mansfield covers all the basics of how to make your own cheese, you'll discover how cheese can go right (and wrong! ), save yourself money and discover that cheese-making is just as fun and easy as any other kind of cooking, but better! 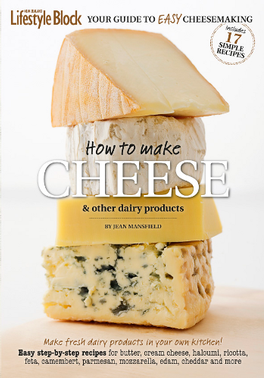 How to Make Cheese and Other Dairy Products By Jean Mansfield - printed in full colour- 80 pages. Be the first person to tell us what you think about How to Make Cheese & Other Dairy Products and you'll save $5 on your next purchase!